An artist’s rendering of Waypointe Pinnacle, approved for a 4.6-acre lot on West Avenue between Orchard Street and Butler Street. The start of Pinnacle at Waypointe construction is four to six months away, developer Paxton Kinol told the Zoning Commission last week. But Kinol is looking for another anchor tenant, because the original tenant has financial problems. The Zoning Commission approved Pinnacle at Waypointe 13 months ago. 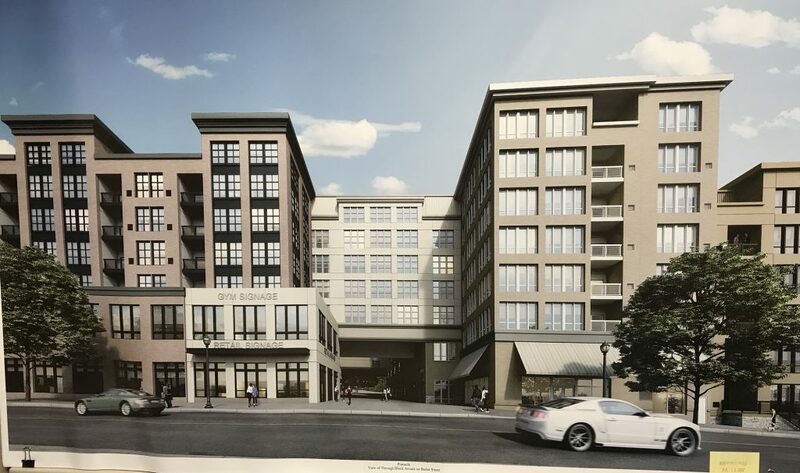 It’s designed to be a seven-story, mixed-use development with 330 apartments, 61,482 square feet of residential recreation area, 55,598 square feet of non-residential space (retail, restaurant, iPic theater and health/fitness club) and a 942-space parking garage for a 4.6-acre lot on West Avenue between Orchard Street and Butler Street. Attorney William Hennessy represented the developer at Thursday’s Zoning Commission meeting, and said he would submit paperwork to extend Belpointe’s approval. NancyOnNorwalk was not at the meeting but obtained a recording. iPic filed a financial report and their chief financial officer quit, Kinol said. Markets Insider reported on Nov. 6 that iPic CFO Paul Westra resigned to rejoin the financial services industry. Westra joined iPic in March, 2017, after more than 20 years as a sell-side analyst covering the restaurant industry, according to CFO Moves. Belpointe has previously done its own construction, Kinol said. He predicted that Pinnacle’s construction will take 27 months. A federal judge has upheld a lower court’s decision to dismiss Alvin Mosby’s complaint alleging racial discrimination and retaliation by the Norwalk Board of Education and the City of Norwalk. Mosby alleged that changes to retiree benefits made in a 2013 collective bargaining agreement resulted in disparate impact on African American employees and claimed that his “personal information” had been leaked to NancyOnNorwalk as retaliation for his complaints of discrimination. NancyOnNorwalk printed a public document, a list of salaries which included Mosby’s address. Mosby, who represents himself, filed the appeal more than a year ago. The United States Court of Appeals for the Second Circuit in a Nov. 1 decision upheld the lower court’s opinion that the changes to retiree medical benefits in the 2013 CBA were imposed as a cost-saving measure, and were consistent with a valid business necessity, the first determinant in a decision to dismiss a case. Mosby could have provided an alternative action that would satisfy the Board’s desire to cut costs without creating a disparate impact but he did not do so, despite being given additional time, the Court said. No reasonable jury would have found the Board of Education’s release of the document to NancyOnNorwalk to be unreasonable, the Court stated. Mosby attempted to amend his complaint to allege a retaliatory transfer and an offensive remark, but did not do so in a timely matter, and only submitted the claims in opposition to the dismissal, the Court wrote. A petition posted last week asks the State Department of Education to investigate a systemic complaint filed Oct. 3 by Attorney Robin Keller. Keller’s complaint alleges that there are wide-spread issues in Norwalk Special Education, including basic violations of the federal Individuals with Disabilities Education Act (IDEA), which spells out the rights of students with special needs. Each of the 17 cases detailed in the complaint represents “a wide spectrum of children,” similar to a federal class action lawsuit, Keller said at the time. Norwalk Public Schools Communications Director Brenda Wilcox Williams in mid-October said that Chief of Specialized Learning and Student Services Yvette Goorevitch had been in touch with the state and would be sending preliminary information to address questions. Wilcox Williams did not answer a Thursday email asking for an update. Keller in a Sunday email said she hasn’t heard from the State yet. Work on a East Norwalk Transit Oriented Development study will probably start in December, Planning and Zoning Director Steven Kleppin said last week. Transit Oriented Development is the “creation of compact, walkable, pedestrian-oriented, mixed-use communities centered around high quality train systems,” according to tod.org, the web site of the Transit Oriented Development Institute. The study will analyze opportunities and suggest guidelines in support of development near the East Norwalk Train Station. Harriman Associates, Inc. is set to do the work, in a $125,000 contract approved by the Common Council on Oct. 9, without comment. Funding comes entirely through a state grant. The study could take a year but Planning and Zoning is hoping to do it in nine months, Kleppin told the Planning Commission last week, in a recording obtained by NancyOnNorwalk. One of Harriman’s first tasks will be to define the TOD zone, which will be done in coordination with a committee of Norwalkers, Kleppin said. Harriman’s urban design and planning studio was formerly known as The Cecil Group, Harriman’s website states. The Cecil Group worked with the Redevelopment Agency to formulate the South Norwalk Transit Oriented Development plan. Harriman and its predecessor Cecil are based in Boston. “Maybe we could hire some Connecticut firms occasionally,” Planning Commissioner Nora King said at last week’s meeting. Many of the firms who submitted bids have worked in Fairfield County, Commissioner Brian Baxendale said. Kleppin added that the funding for the project precluded the involvement of a “big geographic firm.” A bidder who had a subcontractor with experience on the Manresa study didn’t look at the grant award and came in with a budget that was twice what was planned, he said. A public hearing on the new 10-year City of Norwalk master plan is scheduled for Jan. 15, Kleppin said. The Planning Commission, the Oversight Committee and Mayor Harry Rilling have submitted comments to Larissa Brown of Stantec regarding the first draft of what is officially referred to as a Plan of Conservation and Development (POCD), Kleppin and Planning Commission Chairwoman Frances DiMeglio said. The revised draft is due in the first week of December. State statute mandates a new master plan every 10 years. Kleppin said that although the state requires one hearing, the city Charter says there should be two, so expect a second one. iPic is a luxury movie theater chain. What a joke anyone know what the mall is bringing in? While the eye is here on West ave every other venue in Norwalk has a good chance who has a movie venue will close. After a mall meeting at city hall Rillings office I rode the elevator down asking some of those attending whats going to happen to South Norwalk when the mall opens and the movie venues are put out of business, they simply smiled and said oh well. Ipic and 12 other business in Ct are expecting chapter 11 , Norwalkers wake up the sky is falling details in the news weekly explains Norwalk has no promise of holding its own when the Canadian Mall opens. Lets cut to the chase and ask Rilling where all the new high rises are planned and what hoops are taxpayers now have to expect to jump thru? The mall and movies whats the facts here Harry? Free parking at the mall suggests a ghost town everywhere else. Reading about this continued unchecked, unvetted rampant overdevelopment – I agree with Ric – it will kill South Norwalk. Rilling apparently has no concept of city planning, but perhaps others do, yes? Why has this been allowed? Is it as simple as greed? Whoever is involved here – do you seriously want Norwalk to resemble a poor replica of Stamford? As mentioned in other posts, we do NOT have the infrastructure to support all this, in any case. The movie industry is on the ropes. U.S. attendance figures are the lowest they’ve been in decades. Lots of reasons why. Nobody should be basing any plan on new movie theaters. TOD definition should be done in coordination with a committee of EAST Norwalkers. We already know what some others with no skin in this game think.